Today is Take Your Dog to Work Day. 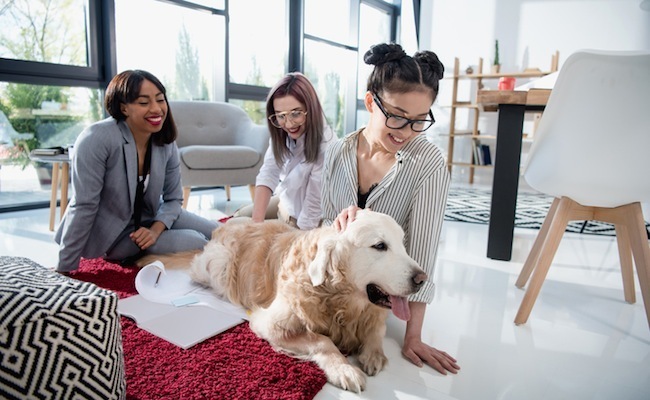 The brainchild of Pet Sitters International, Take Your Dog to Work Day came about as a way to encourage dog adoption and to celebrate and appreciate the joys of having a dog. Anyone who’s ever had the good fortune of sharing their home with a canine friend will know the love and laughter they bring into your life. Dogs are happy-go-lucky, entirely in the moment and wholly unconditional. Those a pretty amazing qualities to have in a colleague, even if it’s just for the day. The last place I worked had an office dog. Although apt, Devon’s role as CFO (Chief Frisbee Officer) was one of many hats she wore during office hours. She actively raised company morale, hoovered food spillage without complaint and offered a furry shoulder to lean on whenever one was required. Her crotch-sniffing antics (though not always appreciated by those on the receiving end) offered comic relief in an otherwise business-focused environment. I never got to meet Devon in person, since she was based at the company’s London HQ, and I worked out of the satellite office in Cape Town. Even so, just hearing stories of what she got up to was enough to lift my spirits. Devon certainly proved to be an asset in the HR department. Wandering in unannounced during interviews put prospective employees on the spot. How you react in those situations speaks volumes about your character. A study by the University of Southern California further highlights the benefits of bringing pets to work. Researchers found pets in the workplace nurture productivity, encourage work-life balance and even reduce absenteeism. With so many excellent reasons for why dogs should be allowed at the office, it’ll be easy for you to persuade your boss to let Fido stay. Who knows, he may even have his own email address before the day is over. Of course, you need to be mindful if you decide to let your furry friend to accompany you to work. Not everyone is a fan of dogs, and some people also have dog allergies. Make sure everyone is on board before going ahead. It’s equally important to ensure your pet will be comfortable for the duration of their visit. Bring a blanket or basket, so they have somewhere familiar to hang out, take them on regular toilet breaks, go for a walk at lunchtime and see that there’s a bowl of water on hand. If your office environment isn’t suitable for pets, you could arrange for you and your co-workers to visit a dog shelter for the morning instead. Shelters are always in need of a helping hand, so try to arrange a collection of dog food and blankets to take with you. Once there, there’ll be plenty of of opportunities to spend quality time with the shelter’s residents. Who knows, a few of you may even end up adopting or fostering a dog. Before you commit to taking a pooch home with you, make sure you have the resources to keep your dog safe, happy and healthy. Animals bring so much love and positivity to our lives, the least we as their human companions can do is make sure they’re properly taken care of. For my colleague who was once bitten by a dog, and has remained fearful of them, this would definitely not be welcome. We must respect the wishes of other people when it comes to pets. I love animals but realize that not everyone shares the same views on pets and workplaces, and this must be recognized. I have invited my assistant to bring here dog to work multiple times but the subway will not allow dogs to ride. Dogs make almost everybody happier.